Over the last few weeks, a series of polls has redefined the state of the electoral race in four local ridings. While some had originally looked like safe seats for incumbents, and others had looked like three-way races, we can now say that with more confidence that there are now a series of two-way races developing in several parts of the city. There’s a good chance that these ridings could see new representatives come election day. For most of the summer time leading up to the elections period, our analysis from previous years was telling us that while the Liberals and Conservatives were close to each other in the riding, we could just not count the NDP out. An initial riding level poll by Environics Research ran on September 20th ended up clarifying the situation, and put the Liberal candidate, Anita Vandenbeld ahead of the Conservative Abdul Abdi by 4 points, at 39% and 35% respectively, while the NDP was still sitting at their 2011 level at 20% of the projected vote. The situation was soon confirmed and even amplified by two following polls from Forum Research and Mainstreet Research, putting Vandenbeld at the 46%-47% mark, and Abdul Abdi dropping from 35% to 29%, without any significant changes to the NDP and Green numbers. Vandenbeld looks poised to take the riding on October 19th, but the race is still on. Things can still change and we must not be complacent. 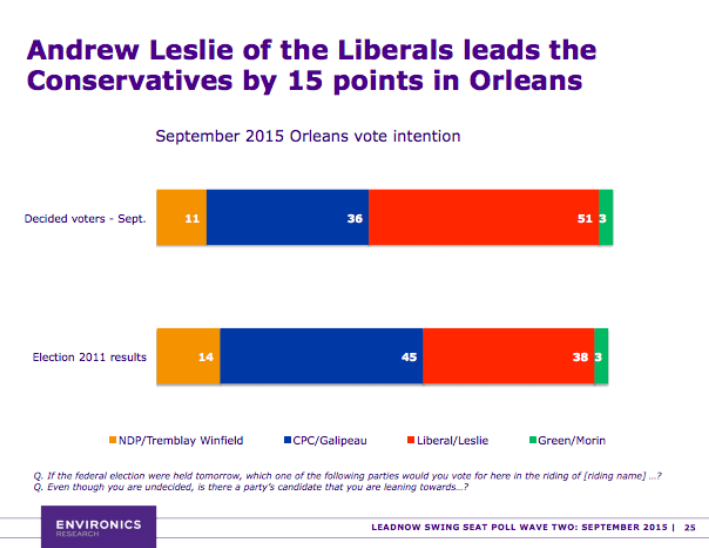 The riding of Orléans has shaped up to be what we had anticipated going into this election period: a two-way race between the Liberals and Conservatives. The Environics Research Poll initially showed Liberal candidate Andrew Leslie with 51% and a 15 point lead over Conservative Royal Galipeau, with 36%. The NDP’s Nancy Tremblay initially held 11% and the Greens trailed with 3%. However, the Mainstreet Research poll released at the end of September indicated an 8 point loss for the Liberals as their numbers fell from 51% to 40%, and the Conservatives fell from 36% t0 33%. The gains made in the poll seem to have gone to the NDP, who shifted from 11% to 19% and the Greens, who shifted from 3% to 8%. While threehundredeight.com is predicting Leslie at 53% versus Galipeau at 30%, showing a large gap, Leslie is still going at it like he’s one vote behind. We also see this as a potentially close race. The Mainstreet poll can be an indicator of a much closer race than we’d think. Nepean is a new story, in a sense. It has been formed in a national rearrangement of ridings in 2012. Initially, the riding looked like a shoe-in for Poilièvre’s former aide, Andy Wang, but it is now looking slightly different. In late September, the Environics Research poll showed Wang with a 6 point lead over Liberal candidate Chandra Arya with 40% and 34% points respectively, while the NDP and Green candidates Devine and Cooke remained at 19% and 8% respectively. The two-way race was clear then. The more recent Mainstreet Research polls (October 4th), however, show a slightly different story. Liberal candidate Chandra seems to have caught up with Wang, leading him by one point at 42% vs. 41% respectively, putting them in a statistical tie, while the NDPs’ Sean Devine is down to 13%, and the Greens’ Jean-Luc Cooke is also down to 4%. This week, our latest Environics poll numbers are showing a shift from the NDP and Green voters towards the Arya, putting him ahead of Wang with 47% vs 40%, showing a clear trend towards the Liberal candidate. The race is still tight in Nepean. It has clearly become a battleground riding as we move towards election day. This riding follows the trend in Nepean. It was created in 2012 and is an amalgamation of the majority of the old Carleton-Mississippi Mills riding and a part of the old Nepean-Carleton riding. Up until last week, it looked like another Conservative stronghold. Much like Nepean, however, the story has changed. An earlier Environics Research poll showed a 7 point lead for Conservative Walter Pamic with 44% over Liberal Karen McCrimmon with 37%. The NDP and Greens were trailing with 13% and 5% respectively. The Mainstreet Research polls released last week indicated a tighter race between the Liberals and Conservatives than originally anticipated. This polls showed another very close race with Pamic at 45% and a mere 2 point lead over McCrimmon with 43%, with the NDP at 8% and Greens at 4%. Our latest Environics Research poll, however, is now showing an 11 point lead for McCrimmon at 50% over Pamic, sitting at 39%. As in Nepean, this is quite the unexpected surprise. Kanata-Carleton is now quite possibly changing. While we must consider this as a tight race, we can at least see Kanata-Carleton as another new unexpected battleground riding. And so, we’re now looking at possibly four ridings that can elect MPs from one of the opposition parties on October 19th. Complacency is not our friend at the moment, but at least we can now look at a possibly of four changes. Let’s keep up our good work!